Who Is Brett Kavanaugh, President Trump's Pick For The Supreme Court? The federal judge is conservative and just 53. He is a former Bush White House staffer with deep political ties and the most experience as a judge on Trump's shortlist. But he is also controversial. 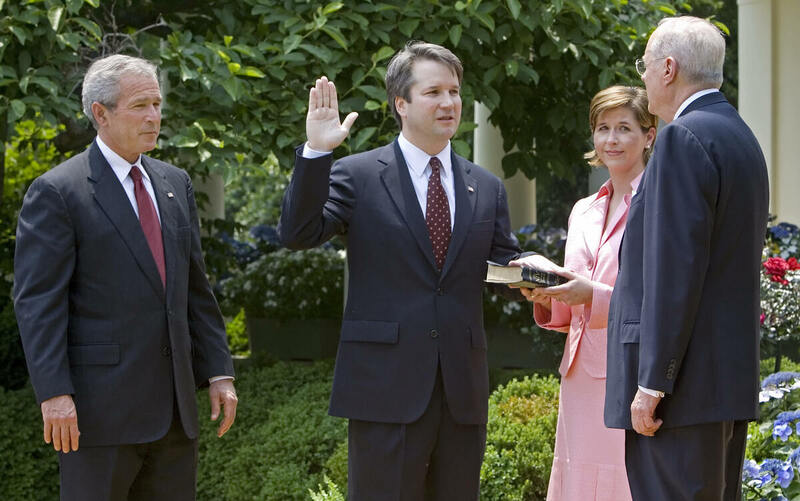 Brett Kavanaugh is sworn in as a federal judge by Supreme Court Justice Anthony Kennedy in 2006. President George W. Bush looks on. Kavanaugh is Trump's pick to replace Kennedy on the Supreme Court. President Trump has chosen Brett Kavanaugh, a conservative judge from the U.S. Court of Appeals for the D.C. Circuit — often thought of as the second-most-powerful court in the country — to replace Justice Anthony Kennedy on the Supreme Court. Kavanaugh is a connected Washington insider with roots in politics in the George W. Bush White House. He has written almost 300 opinions for the D.C. Circuit in 12 years — and he is only 53, which means he could serve on the high court for a very long time. Some conservatives, though, question his bona fides, and he is controversial with Democrats because of his role investigating President Bill Clinton as part of the Starr investigation in the 1990s. And he now believes that a sitting president should be protected from litigation and criminal investigations because they "are time-consuming and distracting." Notably, in an era of hotly partisan politics, Kavanaugh has said that it's important not to be a partisan when one becomes a judge. "Check those political allegiances at the door when you become a judge," Kavanaugh said in 2015 in a speech at Catholic University's law school. He also spoke at length about the necessity of humility. Part of being a good judge, he said, is "Don't be a jerk." 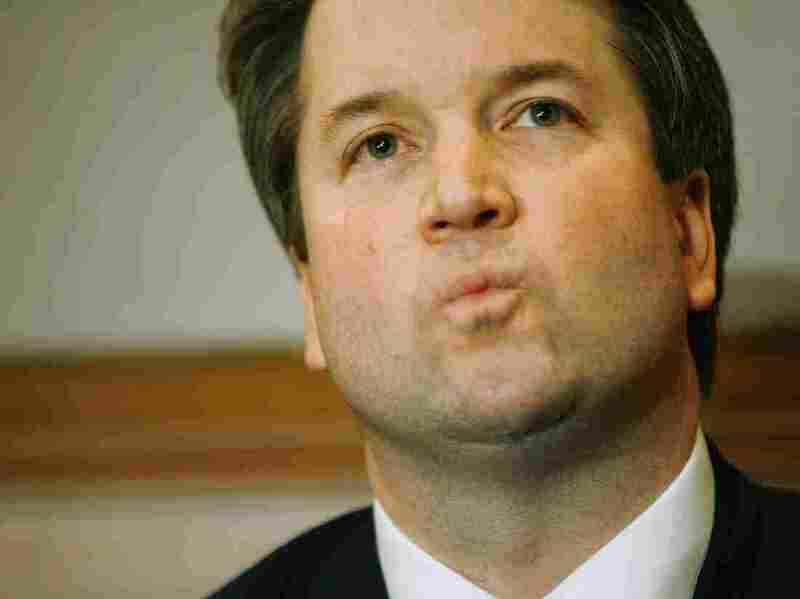 Supreme Court connection: He clerked for Kennedy from 1993 to 1994. 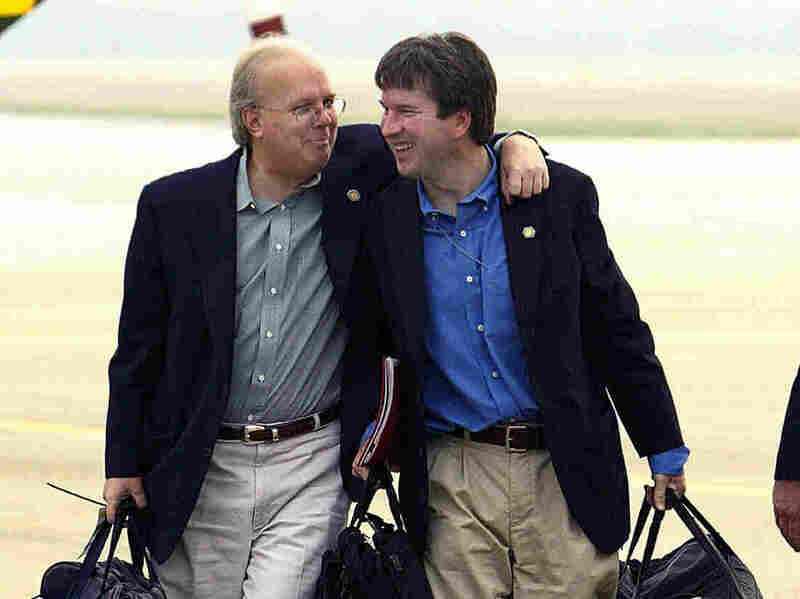 Roots in politics: Kavanaugh was a member of Lawyers for Bush-Cheney during the 2000 campaign and was a regional coordinator for the campaign. He also participated in the Florida recount and served as a White House counsel to George W. Bush and then staff secretary until 2006, when Bush appointed him to his current position on the federal bench. (He was originally appointed in 2003, but Democrats argued he was too partisan and his nomination was held up for three years.) "No one else on the president's current list can rival Kavanaugh for Washington credentials," SCOTUSBlog notes. Presidential adviser Karl Rove (left) with Kavanaugh in 2004. Kavanaugh was staff secretary in the White House at the time. Worked on The Starr Report: He was part of independent counsel Kenneth Starr's team during the investigation of then-President Bill Clinton, specifically assigned to investigate Deputy White House Counsel Vince Foster's suicide. The Baltimore Sun notes that he "argued unsuccessfully before the Supreme Court that attorney-client privilege did not apply to Foster after his death by suicide." "Even the lesser burdens of a criminal investigation — including preparing for questioning by criminal investigators — are time-consuming and distracting. Like civil suits, criminal investigations take the President's focus away from his or her responsibilities to the people. And a President who is concerned about an ongoing criminal investigation is almost inevitably going to do a worse job as President." He's young: His age is an advantage. At 53, he is relatively young, and Trump has said he wants a nominee who could serve on the high court for decades. At age 41, he was the youngest federal circuit judge at the time of his appointment. He fires up the opposition: In 2004, Sen. Chuck Schumer said of Kavanaugh before his confirmation hearings for the D.C. Circuit: "Brett Kavanaugh's nomination to the D.C. Circuit is not just a drop of salt in the partisan wounds, it is the whole shaker." Criticized consumer protection agency: In addition to his writing that a president shouldn't be subjected to litigation or criminal investigation while in office, NPR's Uri Berliner reports, Kavanaugh wrote another opinion that will get a lot of attention. It involves the Consumer Financial Protection Bureau, and, in it, Kavanaugh wrote that the CFPB's structure is unconstitutional, because it is run by a single, unaccountable director — unlike other agencies like the SEC or FCC that have multiple commissioners. "The director of the CFPB possesses more unilateral authority — that is, authority to take action on one's own, subject to no check — than any single commissioner or board member in any other independent agency in the U.S. government." And he contended that the creation of the CFPB is a "gross departure from settled historical practice." Consumer groups and Democrats slammed Kavanaugh's opinion as a politically motivated gift to financial companies. And they were relieved in January when a federal appeals court upheld the constitutionality of the CFPB. But the agency's legal structure is still being litigated. Kavanaugh's blistering attack most likely reflects his broader wariness about the power of the "administrative state." And it probably offers insight into how he views financial regulation. Some conservatives don't like him: There is some grousing in some conservative circles over Kavanaugh. These conservatives, including Texas Sen. Ted Cruz, believe he is not sufficiently conservative. They disagree with portions of opinions he has written relating to abortion and the Affordable Care Act, for example. Kavanaugh attends a news conference with Senate GOP leadership in the Capitol in 2006 during tense consideration of his appointment to the federal bench. His critics don't like a piece of another opinion he wrote having to do with an immigrant teenager who wanted to get an abortion. Even though he agreed with the minority that she should not be allowed to have the procedure, he did so for not as hard-line a reason as another judge. His critics have also been circulating an opposition research document trying to tie Kavanaugh to Alex Kozinski, the former federal judge who was accused by several former clerks of sexual harassment. Kavanaugh clerked for Kozinski from 1990 to 1991 and is not himself accused of any wrongdoing. What's more, these critics don't trust him because he has been part of the establishment; he is a "Bushie" who grew up in the D.C. suburbs. They believe he is exactly the kind of potential nominee who has disappointed conservatives before. Pragmatic, but conservative: Overall, however, based on some 300 opinions in 12 years on the federal bench, Kavanaugh is considered a pragmatic but conservative judge, who believes in textualism and originalism. He also often weighed in against President Barack Obama's Environmental Protection Agency, including, notably in one case — in which he was in the minority — that said the EPA should have considered costs to power plants. SCOTUSBlog notes that his argument was a signal to late Justice Antonin Scalia to take the case. The Supreme Court did, and reversed the D.C. Circuit's opinion, quoting Kavanaugh's dissent. A textualist: Kavanaugh has expressed some admiration of late Justice Antonin Scalia and the necessity of textualism, interpreting law based first on the language in a statute. Kavanaugh said in 2015 that it's important to stick to the established text. Of Scalia, he said, "he's narrowed the areas of disagreement about how to interpret statutes." "Don't be a jerk": During a speech at Catholic University's law school in 2015, a speech lots of people will be combing through, Kavanaugh spoke a lot about humility (and used a lot of sports metaphors likening judges to referees and umpires and the necessity of being consistent). "To be a good judge and a good umpire," he said, "it's important to have the proper demeanor, really important, I think, to walk in the other's shoes, whether it be the other litigants, the litigants in the case, the other judges, to understand them, to keep our emotions in check, to be calm amidst the storm. "On the bench, to put it in the vernacular, don't be a jerk. I think that's important. To be a good umpire and a good judge, don't be a jerk. And in your opinions, to demonstrate civility; I think that's important as well. To show, to help display that you're trying to make a decision impartially and dispassionately, based on the law and not based on your emotions." He added, "We can't act like we're bigger than the game. There's a danger for arrogance, for umpires, for referees, but also for judges. And I would say that danger grows the more time you are on the bench. As one of my colleagues puts it, 'You become more like yourself.' And that can be a problem." A believer in precedent: This could be another thing that upsets the conservative base. In his speech, he also endorsed stare decisis, the practice of following precedent. "We follow precedent," he said. He added that to be a good judge, one has to follow not just the "letter" but also the "spirit" of the law." "Be optimistic, see the day coming, not the day that has gone. This was a favorite saying of George W. Bush's. I worked for him for five-and-a-half years. Love the guy. At graduations, he would say, 'For those of you who've won honors, awards and distinctions, well done. And for the C students, you too can be president of the United States.' President Bush lives on the sunrise side of the mountain. That's the place to live. Be the optimist, the happy warrior. Do not get beaten down." — He grew up in Bethesda, Md., in the Washington, D.C., suburbs. His mother was a public school teacher who went on to become a prosecutor and judge in Maryland. — He met his wife, Ashley Estes, when she was personal secretary to President George W. Bush while Kavanaugh was also working in the White House. Currently, she is Chevy Chase Village (Md.) Section 5 town manager. — Kavanaugh is a past president of the exclusive Edward Coke (pronounced Cook) Appellate Inn of Court. The group is based in Washington and its "members meet regularly during the Supreme Court term to socialize and discuss matters of appellate and Supreme Court practice," according to its website. To become a member, one has to be "actively engaged in appellate practice" and be nominated by a current member. You get only a three-year term, can be nominated for more or elevated to a "Barrister," but, as the group says, "Elevation is not automatic and should not be presumed." — If confirmed, he would help to even the educational balance on the high court, which is currently five Harvard (John Roberts, Stephen Breyer, Elena Kagan, Neil Gorsuch and Ruth Bader Ginsburg — although Ginsburg finished at Columbia) and three Yale (Clarence Thomas, Samuel Alito, Sonia Sotomayor). — He is active in his community. He serves as a lector and usher at Blessed Sacrament Church in Washington, D.C. He also coached the fourth- through sixth-grade girls basketball teams at Blessed Sacrament, as well as a Montgomery County Recreation girls basketball team and the Classics AAU second grade girls basketball team. — He is friends with the president of the Arizona Cardinals, Michael Bidwell, who was a classmate at Georgetown Prep. — He noted that he was hired at Harvard Law School by Kagan, who was appointed to the high court by Obama. Quotable: "Even though he has Ivy League credentials and a fancy job, he's kind of a regular, all-American guy. He likes to play basketball and drink beer. ... It's very refreshing in a town like Washington." — Helgi Walker, who worked with Kavanaugh in the White House counsel's office, to the Washington Post. — Judges' financial disclosure does not appear to require listing all assets. It does include listing investments and trusts. For his most recent disclosure, those total between $15,001 and $65,000 (Bank of America accounts, $15,001 to $50,000; Employee Retirement System of Texas, $15,000 or less). His 2011 disclosure, though, lists a Bank of America account that was valued between $100,000 and $250,000. — His liabilities total between $15,001 and $95,000 (Chase credit card $15,000 or less; Thrift Savings Plan loan between $15,001 and $50,000; Bank of America credit card $15,000 or less). — He lists being a lecturer at Harvard Law (for which he was paid $27,220), the director of the D.C. Circuit Historical Society and an adviser to the American Law Institute. — His 2006 to 2009 disclosures lists his spouse as taking a salary from the George W. Bush Library Foundation as administrative staff.